At WAX Candle Company we want you to experience the maximum enjoyment and pleasure from our candles. We take great pride in making them using only the finest quality ingredients and materials available. It is very important that you burn candles responsibly. To ensure their safe use, please follow these guidelines to keep WAX Candle Company products a bright and beautiful part of your life. For best results keep wick trimmed to 1/4 inch and allow the wax pool to extend to the outside rim before extinguishing the flame. The seller and/or manufacturer are not responsible for misuse. Never leave burning candles unattended. Keep them within sight at all times. Always burn your candle in a draft-free area. Any draft (ceiling fans, A/C vents, windows, etc.) will Place on a protected, heat-resistant, dry surface, away from anything that can catch fire, and out of remake the candle flame flicker and smoke. Ensure that there is enough air space around your candle. Do not burn under a shelf, as this will inhibit the amount of oxygen that is getting to the wick of the candle and can cause the candle to not burn properly. 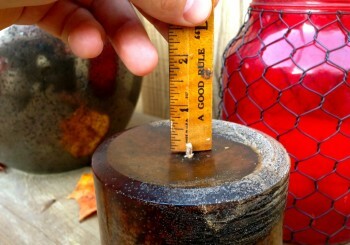 Keep wick trimmed to 1/4” at all times. If smoking occurs, extinguish candle, trim wick, remove trimmings, and relight. Keep the wax pool, free of wick trimmings, matches, or any other combustible materials. Discontinue use if the jar is cracked, chipped or broken. Be sure that the wick is no longer than 1/4″. If it is, extinguish, trim to 1/4″, and relight. Prevent possible heat damage to the counter/surface by discontinuing use when 1/2″ of wax remains. Burning past this point can present a fire hazard and cause the glass to break. Extinguish candle before replacing the lid.